This tab allows you to select which supported events wil be converted. The contents of the list are dependent on which genealogy program you are using. It is most likely that you will use Select All to convert all available events. Primary Tags Only - This will convert only those events tagged as primary in your genealogy program. A non-primary event is usually an alternate or unproven one, such as a different birth date. 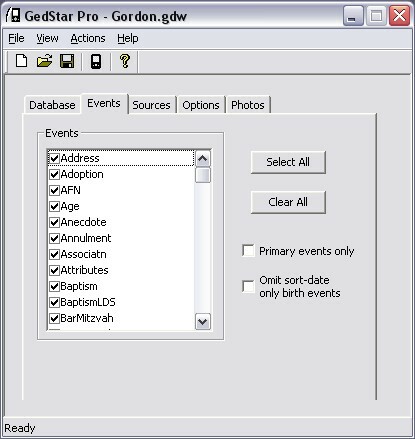 Omit sort-date-only birth events - Applicable mainly to The Master Genealogist to eliminate birth events have no actual data in them.